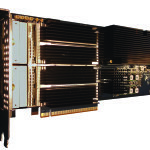 Mansfield, MA, April 15, 2014 – Accolade Technology, the leading innovator in the highest performance FPGA based packet processing Adapter and NIC market today announced the introduction the V2 line of ANIC products offering the industry’s richest set of features at the best possible value per GigE port. Accolade’s newly designed and streamlined V2 (Version 2) products include the ANIC-2KL, ANIC-4KL, ANIC-20KL, ANIC-20KH, ANIC-40K and ANIC-40K3. The next generation V2 series not only offer standard in-line, line rate capture, time-stamp and load balancing features but also include advanced features such as deduplication, flow classification, DPI and traffic management. In addition Accolade continues to enrich its V2 line with additional advanced feature sets. Accolade’s V2 ANIC products establish a new standard for cost, features and performance that is second to none. “Accolade is committed to continuing to set the bar in not only being the leading innovator through multiple high-end market-first product introductions but also the leader in features and value per GigE port in the market,” said Robbie Dhillon, CEO of Accolade Technology.